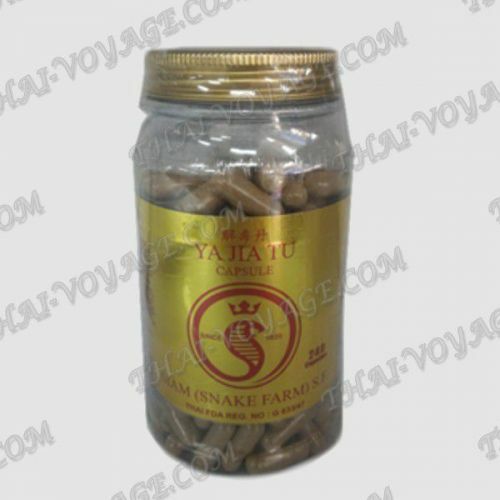 Ya Jia Tu is a drug snake medicine for the treatment of many skin diseases, made on the basis of poison Thai king Cobra. The drug Ya Jia Tu produced on a snake farm. Capsules Ya Jia Tu is a good remedy to treat skin diseases and fungal diseases. The drug contain the active substances produced from the venom of the Thai king cobras, which are effective in the treatment of skin diseases such as red and black acne; dermatitis; wet eczema; psoriasis; allergic skin rashes; ringworm (a fungal infection of the nails, hands, feet); skin diseases caused by problems with the lymphatic system. The drug Ya Jia Tu cleanses the blood and helps to stop various inflammatory processes, increases the level of hemoglobin in the blood. Application: use 2-3 capsules 2-3 times daily before meals with warm boiled water. After the cessation of symptoms (disappearance of the rash, skin improvement, etc. ), discontinue use of the drug. You need to dissolve the contents of 5-7 capsules a 7% solution of edible vinegar, in a convenient container. To withstand the damaged parts of the body in this solution for about 7-10 minutes, one to two times a day for 7-10 days. This procedure is repeated every day. Each time after the procedure to treat a nail brush or scrub affected mildew areas of the body. For the most stable effect it is recommended to combine these treatments with capsules inside. As prevention, you can repeat the course in 2-3 weeks. In the preventive purposes the preparation is Ya Jia Tu take each month for three consecutive days, one capsule twice a day after Breakfast and dinner. It is important to drink warm boiled water. One package – one year prevention. The drug: snake venom, bone, snakes, bird's nest, ginseng, Lingzhi, safflower, Patang, kassia. In packing of 240 capsules.